In May, London newspapers emblazoned themselves with pictures of a naked Greta Sacchi wrapped around a cold, slippery, giant cod. Charlize Theron, Stephen Fry, Sting and other celebs were targeting Nobu for serving bluefin tuna (an activist sneaked his sushi off for genetic tests). Meanwhile The Observer ran a piece on desperate French fisherman, who caught less than their quota, but felt vilified by the soapbox bandwagon approach to the issue. I tired of celebrities with causes a long time ago, hastened to revolt by the likes of Bono (who actually gave me a hug once) and that other African infantilizer Bob Geldof. Nobu Matsuhisa is as big a celebrity as a chef can be. An affable man, his face turns distressed when I mention the boycott. “I do care,” he says. “People have feelings about it, but we are doing nothing illegal”. He’s not pleased, but apologizes for refusing to comment further. At Nobu, Berkley Street, London, certain menu items are marked with an asterisk: ‘bluefin tuna is an environmentally threatened species, please ask your server for an alternative’. At first I thought this a daft copout. But on reflection, all of us constantly make such choices. Until it is illegal, it’s a matter for his karma. Isn’t it smug to askew bluefin because it happens to be the cause célèbre poisson du jour, while daily tucking into other equally problematic produce. I felt guilty enough for eating Patagonian toothfish last year in Terra del Fuego. On the menu of every restaurant and not expensive, how endangered could it be? What fish isn’t overfished today? Weeks pass when you can’t find anchovies in our supermarkets. Most of the protein in our industrial agriculture that is not endangered (beef, corn, soya, chickens) is farmed in ways as environmentally catastrophic. Yet the outcry had its effect; I opted for the Wagyu teriyaki (at £20.50, more expensive than the bluefin toro). The massaged beef was perfectly broil charred on the outside, the red centre melting in the mouth. I saw no warnings on Nobu menus elsewhere in the world. In Los Angeles, Matsuhisa, the original restaurant where he first teamed up with Robert de Niro to form Nobu, has that unassuming feel of a place where it all started; a sushi shack, with silhouettes of diners painted on the walls and two huge plastic lobsters mounted behind the counter. I chose the chef’s recommendations or omakase menu ($75). First up, ankimo (monk fish liver paté, rich and firm in texture) with caviar; then a most delicious titbit, a perfectly fried oyster wrapped in paper thin pastry with a wasabi coating. You fold it in a lettuce leaf and consume the parcel whole. Next, Nobu’s world famous sashimi salad with Matsuhisa’s trademark dressing, followed by delicately cooked sea bass marinated in sake. After, a plate of nigiri: sea bream, Norwegian tuna, a translucent white fish and a mouth-watering, suspiciously deep-red piece of tuna. Was it the politically incorrect species? I waiver, but here it is dead on the plate. Surely they’d only serve “black diamond” to those who demand it? To conclude, delicate banana spring rolls and chocolate. TriBeCa, New York has Nobu’s Michelin-star, flagship restaurant; an intimate, warm, buzzing venue, with ochre hues, birch trees and a wall made of river pebbles. This time, I specifically order yellowtail sashimi with jalapeño ($19). Matsuhisa’s combinations with chilli arose from his formative years spent in Peru. The uni (sea urchin roe in a nori boat) is bright orange, buttery, a complex taste that makes a full circle of flavour in your mouth. The squid pasta ($19) is intriguing and rewarding – squid cut to look like pasta, accompanied with asparagus, shitake mushroom and baby veg. Nobu’s signature dish is the black cod ($26). This is a frozen fish, Matsuhisa told me proudly, that “27 years ago almost nobody used, but now is all over the world”. A friend in London, who caters to the high end including royalty, said a few years ago all his clients were demanding he replicate it. Adding its fifth continent, Nobu opened earlier this year at the One&Only. As at all Nobu restaurants the staff greet you loudly in Japanese as you enter, but this enormous restaurant with voluminous ceilings and dull hotel decor, is the least inviting of the Nobu’s I’ve experienced. The mezzanine lounge bar serves a Matsuhisa martini if you like sake and need courage. Be prepared, it is probably the most expensive restaurant in South Africa. Budget R600 a head for food and you’ll have a splendid time. I recommend you take up a seat at the sushi counter. At these prices, I also want to be entertained. The chefs are marvellous to watch, in a flash conjuring up small towers of food from a myriad of ingredients with their chopsticks. Takahashi has 10 years at Nobu, first in Tokyo then Berkley, where his assistant Harubasan also worked. 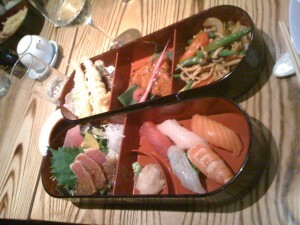 For lunch, the best value is the generous bento box, almost identical at all Nobus (R235 / in LA $50 / in London £28). Though otherwise up to standard, the day I tried it in Cape Town the rock shrimp tempura with ponzu (a citrus juice) was soggy and nothing like the sensational dish it was in New York. However, for dinner, the 7-course omakase (R550) was even better than my meal in LA. Highlights included the salmon tatar with black caviar in a bowl on crushed ice; delicate flamed sake beef teriyaki with mushrooms; the mackerel sushi; and the kind of chocolate dessert you need when you break up with a lover. The 7-course Cape Town omakase (R650) is clearly still in an experimental phase – interesting but less successful. When I met Matsuhisa, the poor man in quest for authentic local Cape cuisine had just eaten at the worn out Noon Gun café! He has picked up that curry and spice is part of our heritage, and is innovating around this; fresh cardamom leaves garnish a plate of firm yellowtail sashimi; the sashimi salad has a fiery green jalapeño sauce instead of the usual dressing. The cooked kingklip is sublimely delicious, but doesn’t shear as well as it should with chopsticks. The Alaskan black cod with sweetened miso sauce was better than in New York. The only disappointment was rather chewy rib-eye beef with Nobu’s Peruvian anticucho sauce. The Cape lobster made delicious sushi. Instead of tofu miso soup, it was accompanied by a spicy seafood version. Dessert featured a delicate malva pudding that reinvents our stodgy old tradition. Watching the diners, it was clear locals are still trying to get to grips with the menu here, and as a luxury establishment the recession niggles. “You cannot cut food cost or cut quality,” Matsuhisa tells me. “The customer is still spending the same money. The best food and the best service is the only way,” then he adds, “and to be patient”. With the world cup on our doorstep many establishments hope they won’t be treading water much longer. Nobu, Cape Town, Dock Road, Victoria & Alfred Waterfront. Tel:021 431 5111. Matsuhisa, 129 N. La Cienega Blvd, Beverly Hills. Tel: 310 659 9639. Nobu, 15 Berkeley Street, London. Tel: 207 290 9222. Nobu New York, 105 Hudson Street. Tel: 212 219 0500.